As part of Holy Week, we will gather at 7 p.m. Thursday, April 18, 2019, for a Maundy Thursday Taizé with Holy Communion. We’ll join Jesus and the disciples at the Last Supper and contemplate the ultimate Gift of Love through scripture, prayer and song with music from the Taizé Community. Join us for a short, but impactful, Good Friday Service of the Cross at 6:30 a.m. Friday, April 19, 2019. 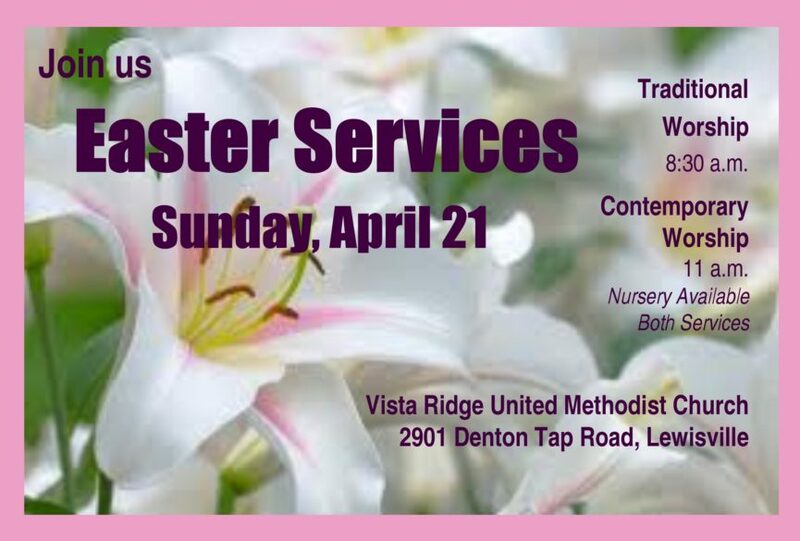 Led by Angie Christoffersen, the service includes scripture and carrying of the cross to the corner of our church property. We will celebrate the Risen Christ during Easter worship at 8:30 and 11 a.m. Sunday, April 21, 2019. Pastor Mary Beth Hardesty-Crouch will give the sermon. Invite your family and friends to attend. There will be no Sunday School.